hey everyone.. I'm back in LA trying to get over my jetlag in less than a week... I thought I had it beat, but it's 1235pm on the 4th day back and I can barely keep my eyes open. I will try to update a few more backlogged entries before I head back at the end of January, but wishing everyone a happy holiday and happy new year! Aren't the cookies above super cute? I found it from pinkcakebox.com. If you feel like holiday stuff, I spotted holiday cupcakes and frosted cookies at Ginjer Cakes.. But it's always more fun to make them yourself so you can eat them hot out of the oven... if you are lucky enough to have an oven in Taipei, that is. I think that I visited Swensen's in Taipei when I was a kid, but I can't be sure. Before all you had so many selections for American food, Swensen's was the place to go (next to Sizzler.. remember when Sizzler was THE American place to go in Taipei? hahah). Now it's sort of the Denny's of Taipei with its late night hours, generic American menu and breakfasts- not to mention its decor, service, prices and food. For NT$180 for a milkshake, I expected it to be diner-sized, meaning in a full glass with a silver shaker of more milky ice cream goodness to refill yourself. Instead we got a slim tall glass. It is actually plenty for lunch, with the richness and flavors, but still expensive for the amount that you are getting. On this day, we got a set menu special because it was Mon - Fri between 11am- 5pm of adding NT$10 to any entree and getting a set meal (meaning w/ a soup or salad and beverage or dessert. Extra for milkshake. The French Onion soup was decent, though there was no melted cheese anywhere. The mushroom hamburger my friend got (NT$260) was sizeable, though I thought they were skimpy on the fries. However, I had a sort of weird experience with my club sandwich. When you order, you have the option of ham or grilled chicken. When I ordered, I said "ji" or chicken in Chinese when the waiter asked me which I wanted. When the sandwich came, it had ham, which looked decent, but we pointed it out still and the waiter (different from the one that took the order) just took it back to the kitchen. Then a few minutes later, the waiter that took the order came back with a look on his face- don't know if he was angry or annoyed, but definitely not happy. He said we ordered "ham and cheese" and I said, "no, I ordered chicken." I guess he misheard my "ji" for "cheese," but he also didn't repeat my order for what I said for confirmation. Either way, I figured they would just redo it with no problem, but it was sort of strange the attitude he was giving us. When the grilled club finally did come about 10 minutes later, it was more less plump and juicy than I had imagined and I should have just taken the ham and not said anything. I don't know. Do you guys send stuff back if it's not what you ordered, or what point do you just keep it? Personally, I think the attitude does make all the difference. We were even nervous that they might have done something to our sandwich (which I know is rare these days, right?) and they probably didn't, but it just made the sandwich all the less appetizing. Kid friendliness: one large table with bench style seating with smaller table/seating around. no high chairs but room for strollers. Argh! I hate rewriting something that I've already written, trying to make it the same which is impossible. My computer froze and the alledged blogger autodraft failed me. Miserably. So here goes my attempt #2 at Nonzero. Organic foods and restaurants are part of the latest trend in being healthy and treating our bodies right, and Taipei is no exception. I've heard about a few other organic restaurants and even home delivery services, but the first time I heard of Nonzero was when we went. Nonzero's menu is not huge, but offers a few options for salads, appetizers, pastas and grilled meats in English and Chinese. I imagine it's quite seasonal like most organic based restaurants. We got the set menu which included soup, daily special and dessert for about NT$550. It's also a bright cool space with a huge rectangular wooden table with family style seating with a few typical tables on teh side. There is also a small take-home shopping area in the back of fresh vegetables and such. Our friends who introduced us to Nonzero said their brunch is also quite good. They also had fresh bread (with raisins. ick) and olive oil before the food came as well as some homegrown raisins on the stem (double ick. Can you tell I don't like raisins). I loved the hearty vegetable soup which was light and flavorful, as well as the ala carte sweet roasted peppers salad (NT$180). I also thought my friend's seafood creme linguine (changed to vegetarian) was creamy but not heavy and my own roasted chicken was too dry with slightly underseasoned sauteed mushrooms. The set menu also came with a grilled pear which was not too sweet. Felt like a bagel that day to go with a vanilla latte and a place to sit down. Barista had bagel sandwiches. They let me order a bagel ala carte, but they didn't have any cream cheese. They offered strawberry jam or butter. The bagel was served warm, but not toasted.. it was a more bread-like bagel than chewy bagel like those offered at NY Bagel. You've probably spotted these around town- the website says they've been around since 1997. Their coffees/teas range from NT$100-150. I'm not a huge coffee drinker and I like it on the sweet side, so I tend to favor Starbucks and Coffee Bean for their vanilla lattes. The latte here was not bad and not bitter (which I can't do). The servers probably understand less English than you would get at Starbucks... but pointing helps too. Don't confuse this Sabatini as a new branch for the locally owned Sabatini Cucina on Chang An like I did with their similarly elegant atmosphere and friendly service. Apparently, it's a Italian restaurant from Japan- but either way, it's a very nice place to sit down and chat have some afternoon tea after a morning of shopping or walking around with your relatives (which is what we did). While most of us were too full to have the afternoon tea buffet (NT$299), it seemed like quite a good deal. All you could eat tiramisu, panna cotta, sorbet, pizza and coffee or tea for a set price that was about the same as one drink and dessert. A good option for business meeting, ladies who lunch or even an afternoon date. It wasn't very crowded and we were allowed to linger and relax. Everything tasted pretty good and I was very curious about their pizzas which seemed made fresh by request, and definitely eyed my Uncle's glass of mini scoops of sorbet. I will have to come back and check out the lunch or dinner menu sometime again soon, although I'm not encouraged by lone locust's review of their pizzas. Located on the 11th floor of the green Sogo, check out the Japanese gardens and the view of the busy street below if you get a chance. where can you find... the best waffles in Taipei? When I first moved back to Taipei, I always had a lot of questions about where to find this or that.. I want to try something new because I know there are a lot of people who visit the site who actually do live and eat in Taipei with some great knowledge (though some of you just come to look at pictures of xiao long bao or beef noodle soup. hahah), or are looking for something in particular. So I want to try every week to post "where can you find..." something and PLEASE respond if you have an opinion. Also- if you have been LOOKING for something, let me know, either in the comments section or email and I will post it up in a future "where can you find..." and hopefully our fellow readers (lurkers!) will help us out. So this week- where can you find the best waffles in Taipei? Some places I've spotted waffles- coffee shops, McCafe, Hyatt Cafe, Big Tom's, Joyce Cafe- where it's more for afternoon tea or dessert. I think the best waffles I've had in Taipei were at the Formosa Regent Hotel. That was a few years ago so I should go back to refresh my memory and see if it's still the same. I like my waffles light, airy and crisp, not thick and cake-like which tend to be the case here. Also if you make your own waffles at home, what's your favorite recipe or where do you get the mix or waffle makers? I find it easier to use a mix as a base and add a few things. While they have Krusteaz at Costco and various Japanese brands at the supermarkets, I haven't been able to find Betty Crocker here so I actually brought a box back from the states... I think I will bring back a waffle maker too on my next trip around. I think all this time I had the Grand Formosa hotel confused with the Far Eastern hotel.. and I think that the good waffles I had years ago was at the Far Eastern since the Grand Formosa revisited was NOT good. I will have to revisit the Far Eastern sometime and see, and it makes sense since it's a Shangri La hotel. Kid friendliness: didn't spot high chairs, but can't imagine that this restaurant isn't bustling with families and kids during their weekends and nights. Take your out of town friends to Din Tai Fung. But impress your local friends or relatives by taking them to the nearby Kao Chi or when there's too much of a wait at DTF. With xiao long bao that's just as good (and cheaper!) and a much more extensive menu of Shanghai and Chinese deliciousness including shanghai fried stuffed buns, beef noodle soup, dim sum, stir fried rice cakes, veggies, seafood and desserts like cool almond tofu, I was surprised I hadn't heard of or been taken to this almost 60 year old establishment earlier. Kid friendliness: no kids or babies that night. didn't spot any high chairs. sort of a lovely dinner retreat for grownups. get a babysitter and have a romantic evening out, or maybe have an early dinner before the dinner rush. First, you have to know that I'm a sucker for a beautifully plated dish. Maybe it's from watching too much Top Chef, maybe it's from eating too many family style Chinese meals, but something about how someone can make a little tower of food look like art that you almost don't want to disturb the contents to eat it. It's almost magical. Second, I don't like pretty food that doesn't taste good. But Forchetta doesn't disappoint by giving you pretty and not tasting pretty. It looks pretty AND tastes delicious. The bites of steak I had left me wanting for more. Maybe it was the smaller portion from our set menu course. Maybe it was the tenderness that made me want to keep chewing and chewing until it dissolved in my mouth. Maybe it was just THAT good. From start to finish, our meal made my mouth water from the minute the waiter put each plate in front of me to the minute I left the restaurant (with the exception of the wee-too spicy for me pasta with chicken). I have to give credit to our friends who discovered this Italian fusion bistro with a modern romantic setting which opens out to a little patio that you would not expect to find in a little alley in Taipei, but if you've lived and eaten here long enough, you are sort of not surprised. Our friends were the ones who asked the waiter to ask the chef to put together a set menu of the chef's picking (and treated- so sorry for not knowing/noting the prices for each dish). From glancing very quickly at the menu (in both English and Chinese, entrees averaging around NT$800), you could put together the same yourself, but I don't know if the portions we got that night were set menu portions or standard menu portions. The chef/owner has worked before at VVG (Hao Yang) and Cosi O Cosi and you can sort of see the evolution. If you like the food at either of those places, consider Forchetta a more grown up version. It seemed like the night out for adults as the tables quickly filled up with nicely dressed groups of Chinese and English speakers- I'm not sure how many were walk in and how many were reservations. The other tables also lingered from 7pm past 10pm, still having conversations after we left. Also, I've never seen this before, but I suppose it's a unique way of combining the flavors of bruschetta without the mess- they took the toasted bread, give you a half tomato to gently rub against each slice and spread some garlic mayo ontop. The result is a do-it yourself mix of flavors and textures that is addictive. While I don't usually like to eat quail (the small bones and size freaks me a out a little bit), I couldn't help but to try a bite of the perfectly crisped skin and juicy meat. The meal ended with a rose flavored berry mouse, lemon sorbet and chocolate cake that once again looked almost too pretty to eat. But I did and the refreshing icyness of the sorbet was a good contrast to the richness of the chocolate. I was going to just blurb a little bit and tease with some pictures because it's 3am in Taipei and I'm really tired and I thought blogging would cure my insomniai, but I ended up writing about the whole meal. I couldn't decide if I should strongly recommend or do a regular recommend with just one visit, but I just couldn't stop thinking about the food and with a long list of other places to blog about, I chose this one, so hopefully if you visit Forchetta, their plates will look and taste just as pretty for you and leave something for you think about even if you have insomnia. Kid friendliness: coffeehouse by day, lounge bar by night- not the kid friendliest place with smokers and hipsters drinking their coffee in loud music. Looking for a new place to have some afternoon tea, I was tempted by someone online who declared that PS Cafe's brownie were the "best in the world." So why not give it a try at NT$100. When I got to Dun Hua South Road, I spotted a tall office building with the address that I written down. Confused, I peered inside and the guard asked what I was looking for. I said, I was looking for a restaurant. PS Cafe? He pointed me through the building and making a left onto the alley parallel to Dun Hua where I spotted the small patio. If you know where Haagen Daaz is on Dun Hua, then it's sort of "behind" it. PS Cafe is pretty tiny, but with cozy lounge seating and a full drinks menu for coffee, lattes and alcohol, with a strange assortment of snacks and dishes for its food menu- including such items as paninis, lasagne, poutine, nachos, popcorn and hash browns (all for under NT$200). The service is friendly enough, though I think two of female servers were bored and putting on their makeup at one of the tables while everyone was being hosted by the guy server. They were happy to show us a sample of the nachos when we thought about getting something salty after eating something sweet, and they had made one for the other customers (microwaved shredded cheese w/ meat sauce atop of corn chips, btw. I miss goopy nacho cheese out of a jar). I'm curious about the other foods on their menu- though the servers seemed to be putting everything together themselves, so I think they microwave/reheat everything rather than cook it. But back to the brownie. We ordered one brownie to share (NT$100). They were out of vanilla lattes, so I ended up with a decent milk tea (NT$150) and my friend got a latte (NT$100). The brownie was served warm, but was more like a dense cake than the traditional fudge brownie. It was still a good solution for a chocolate craving- dipping each bite into the whip cream on the side- but I couldn't help but to think that it wasn't a brownie. For those who prefer cake-like brownies, it probably won't bother you a bit. PS Cafe is a good alternative to Starbucks or the nearby Haagen Daaz to chill with friends after work or shopping, or for a late night snack since they are open until midnight. It wasn't too crowded in the afternoon and if you didn't feel like coffee, you could get a drink with something a little extra instead. 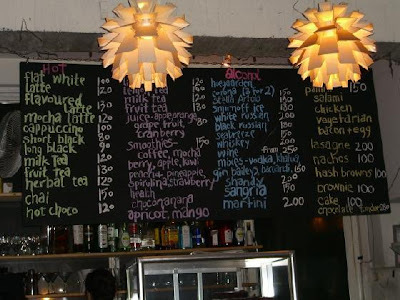 Kid friendliness: lots of crowded booths and boisterous atmosphere with lots of choices at affordable prices. did not see a lot of room for strollers or high chairs though. maybe call to check when you are making reservations. It's not an understatement to say that Casa Della Pasta offers a LOT of different pasta dishes. But strangely enough, my favorite thing there was the chicken pita. With light pita bread (perhaps made with the same dough as the pizza), caesar style romaine and dressing and grilled chicken, the combination was a light, refreshing and satisfying entree, especially at NT$170. I think the crumbled bits of bacon really made it just right. The pasta dishes are equally affordable from NT$95- NT$190 with hearty portions piled atop of the plate. You can choose from spaghetti or penne pasta and then choose the sauce- many variations of a basic cream or tomato sauce- along with a few pesto, olive oil and garlic or special sauces. I think we've been conditioned to pay about US$10 or so for a plate of pasta- which if you think about it is super super cheap to make. So with plates at Casa Della Pasta averaging US$3-6, it's a decent night out without having to eat at the food court and they don't skimp out on the portions because of the price. From sampling the dishes around the table, the red sauces seemed to be a bit salty that night. I wasn't alone in my opinion of that the bolognese spaghetti and the pizza suffered from an extra pinch of salt that took away from the otherwise decent flavors. I didn't get to sample it- but the cream sauce with tuna seemed popular- maybe a Taipei Italian version of Tuna Helper? There are eleven 7 inch pizzas available from NT$140-180, from the plain cheese to the more unique mushroom and anchovy or pineapple smoked chicken, as well as a calzone. The pizza was just okay- with the too salty sauce and too thin layer of cheese. I couldn't even really tell what the toppings were. It's a popular place with locals- we squeezed in with our friends who had prior dinner reservations on this occassion on this packed night- so you can either call to make your reservation in advance or chance a wait. The atmosphere is casual yet more date-night friendly than the even more casual Bellini Pasta. The menu is in English and Chinese, with a handful of appetizers and salads, with the main focus on pasta and pizza and other mains like pitas and gnocchi available, as well as specials like lasagna and risotto available only on Saturdays. It's not too hard to find- an alley away from Dun Hua Eslite and across from Ginjer Bakery. Just look for this sign if you are going at night. PS Weirdly enough- there is another Casa Della Pasta with a strikingly similiar menu on Bei An Road and casataipei.com , but I'm not sure if the two are related or not, or maybe used to be and are not anymore? On the business card, it's not listed. Kid friendliness: Self serve donuts, so kids can pick their own. Cafe style seating to eat the donuts right away! Before Dunkin Donuts hit Taipei, I was able to nosh on some in Pusan, Korea where the American brand donut shop is also self serve for pleasant and take your time browsing. I was pretty happy with the experience, thinking if they can bring it to Korea, why not Taipei? A short year later, DD hits Taipei, but has the American donut successfully translated over here where Mister Donut seems to be the reigning king of hole-y desserts? Well... unfortunately, no. At least not from my first impressions from a late afternoon gathering of Munckins and a mocha frosted cruller. The munchkins were stale and made me yearn for the light chewiness of Mister Donut's mochi ring donuts, which the local DD has also presented its own variation. I've heard mixed things about the Dunkin Donuts debut in Taipei on various expat boards- supposedly the tastes were spot on in the beginning and then slowly adjusted (ruined) to local tastes. What's the point of having an American brand if you are going to make it taste like anything else you can get here? Maybe the donuts just don't age well over the day or aren't the freshest in that particular location. Maybe my childhood cravings for Munchkins just built my expectations too high for what I wanted to taste. Maybe I'll give it another shot- another location, earlier in the day. Until then, you might spot me buying a mochi ring if there's no line at Mister Donuts. If you happen to want to try it out yourself, the donuts average about NT$20-35 each, with hot and cold drinks and sandwiches also available. PS- Again, I know it's a lot of work- but I still have a problem with international companies who do not put both English and Chinese on their info pamphlets. How am I supposed to find these other locations if I don't have a friend who can translate for me?